2016-2017 has been a year of sustained growth for MICDE’s research portfolio. The number of faculty affiliated with the institute stands at 130, spanning 30 departments and eight schools and colleges. The Center for Scientific Software Infrastructure was established to bring together the U-M community engaged in developing open scientific software. It will focus on establishing best practices for developing, disseminating and documenting scientific software in the public domain. 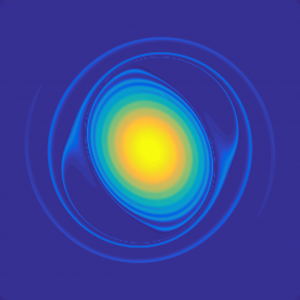 Led by Prof. Emanuel Gull (Physics), the Center aims to provide training and support for researchers that are ready to transform their research codes into well-engineered software. It offers grant support in the form of programmers, consultants, and administrative assistance. It includes a portal to share your code with the research community at large. MICDE’s two established centers, the Center for Network and Storage-Enabled Collaborative Computational Science (CNSECCS) and the Center for Data-Driven Computational Physics (DaCoP), each held their first symposium, showcasing their first year of research activities. This included evidence of the growing reach of OSiRIS, the open framework for storage, computation and collaboration against big scientific data, and the first results from ConFlux, U-M’s groundbreaking computing cluster for data-driven computational physics. These results have been presented at several conferences, and are appearing in the leading computational journals. and probabilistic computational frameworks for rare but often catastrophic events. The past academic year MICDE hosted 14 external speakers with backgrounds and research concentrations that span the breadth of computational science of today and the future. 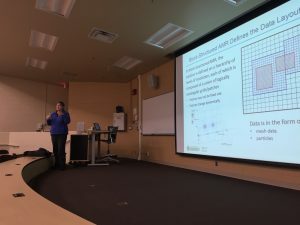 The series culminated in MICDE’s annual symposium: “The New Era of Data-Enabled Computational Science,” which featured talks by worldwide leaders in computational science, including U-M faculty. The symposium included a student poster competition with over 50 entries. 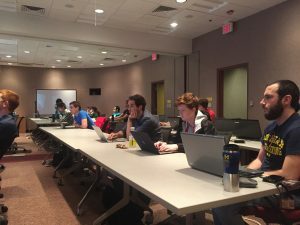 MICDE faculty are committed to growing the already strong U-M community of computational scientists. Over the past year, as before, we have organized a number of workshops to foster collaboration and put together interdisciplinary teams in response to funding calls from federal agencies and foundations. MICDE offers faculty teams institutional support and direct links to our excellent educational programs as well as cyberinfrastructure, all of which strengthen faculty proposals. With the backing of our parent unit, Advanced Research Computing (ARC), and its technical and consulting services (ARC-Technology Services, and Consulting for Statistics, Computing and Analytics Research), this effort has raised over $22M in external funding over the past 2 years. This includes support from federal agencies (NSF, NIH, and DOD), as well as from industry. We also work with the academic units at U-M to identify compelling new areas for recruiting the type of faculty members who will drive computational science in the future. University of Michigan students are invited to apply for Michigan Institute for Computational Discovery and Engineering (MICDE) Fellowships for the 2017-2018 academic year. These $4,000 fellowships are available to students in both the Ph.D in Scientific Computing and the Graduate Certificate Program in Computational Discovery and Engineering. Applicants should be graduate students enrolled in either program, although students not yet enrolled but planning to do so may simultaneously submit program and fellowship applications. Fellows will receive a $4,000 research fund that can be used to attend a conference, to buy a computer, or for any other approved activity that enhances the Fellow’s graduate experience. We also ask that Fellows attend at least 8 MICDE seminars between Fall 2017 and Winter 2018, attend one MICDE students’ networking event, and present a poster at the MICDE Symposium on March 22, 2018. For more details and to apply please visit http://micde.umich.edu/academic-programs/micde-fellowships/. Interested students should download and complete the application form, and submit it with a one-page resume as a SINGLE PDF DOCUMENT to MICDE-apps@umich.edu. The due date for applications is May 19, 2017, 5:00 E.T. We expect to announce the awardees onJune 5, 2017. We encourage applications from all qualified candidates, including women and minorities.